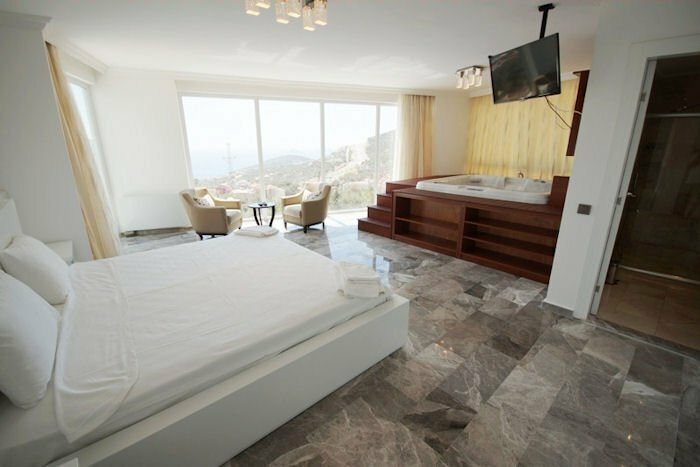 Villa Ortaalan, located in an elevated position offering spectacular views of Kalkan and the Bay and pleasant breezes during the hottest summer months. Perfect for families and larger groups alike. If you love outside living then Villa Ortaalan is the place to be with a magnificent infinity pool, plenty of sunbeds and umbrellas and private balconies with fantastic views on the upper floors. Villa Ortaalan offers a pleasing modern open plan design and interior decoration lend a look and spacious atmosphere to the villa. Kalkan town is within easy walking distance and its only three minutes to the nearest shop. Villa Ortaalan is built over three floors and has six bedrooms all with en suites facilities. The garden and pool have fabulous views of the bay and open sea below them.Villa Ortaalan is ideally located with heavenly views offers a touch of luxury where everything is carefully considered for you to have a truly special villa holiday experience. The villa consists of 6 En suite bedrooms and one of them has a private jacuzzi with amazing sea views.